From the [File] menu, select [Download from DS], and select the working folder where the downloaded project file is to be placed. 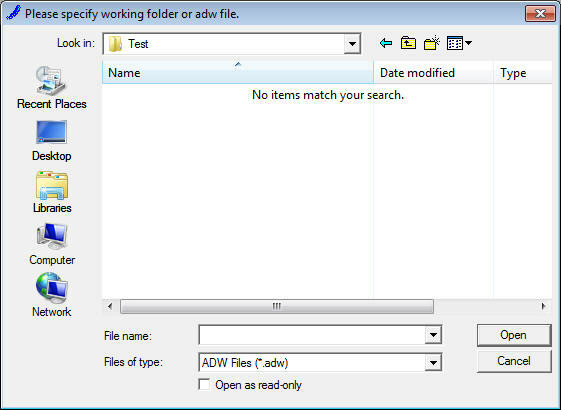 When the working folder is created, an adw file is created. 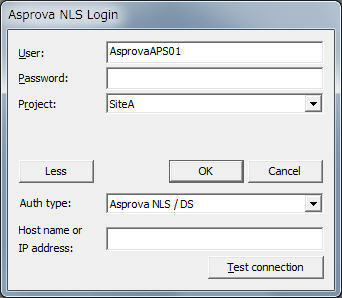 From the next time on, by opening this adw file with Asprova, you can omit project selection at login. When linking with Asprova DS for the first time, press the "Expand" button and enter the IP address of the machine on which Asprova DS is running. For information about this dialog box, click here. This can be executed only after acquiring the right to edit. Since the project file will be uploaded, all the data such as project settings, scheduling parameters, GUI settings etc, will be uploaded. Table data of orders, materials, and Integrated Masters that has been modified can be uploaded as differential data. Moreover, in Ver. 13.0.0.0 and later, tasks moved by mouse operation, tasks that have been unassigned, and so on, can be uploaded as differential data. However, property changes and the addition and deletion of objects through command execution or right-click popup menu reassignment are not entirely subject to differential upload. To do such a thing, please upload and download the project.